I published a post on pet product safety fails and a podcast interview with Center for Pet Safety not long ago, so I was so happy to catch the NBC Today report on pet safety restraints for your car. Unambiguous, substantive information was gathered by National Investigative Correspondent Jeff Rossen, alerting pet owners: Most pet travel safety restraints on the market failed to pass independent crash testing, even when packaging states otherwise. Reporting began with a general nod to pet travel safety in vehicles, showing what can happen when dogs are allowed loose in the car, even two dogs falling out an open window onto a road with oncoming traffic. 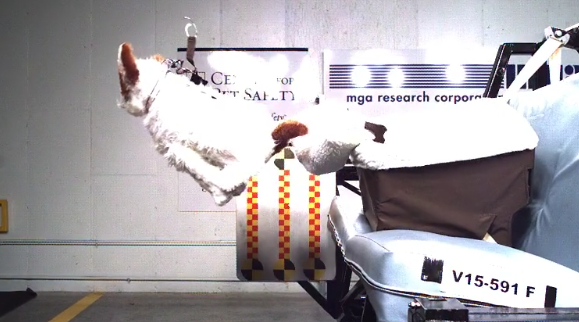 Crash-testing videos from Center for Pet Safety gave viewers a good look at why pets should be properly restrained – hopefully with a product that actually works. 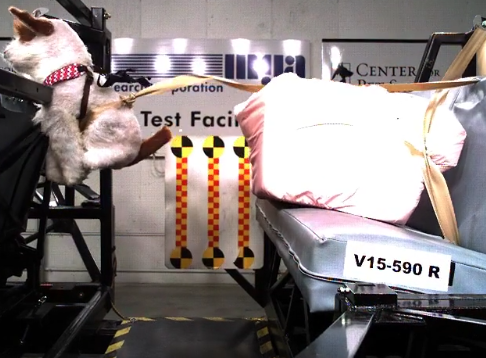 While the American Pet Products Association (APPA) did acknowledge to NBC that safety restraints are a good idea, they had no comment on crash testing results. 25 of 29 products failed to keep dogs – and therefore passengers, and other people on the road – safe. The violence of these tests – crates breaking apart, dogs flying through what would be the interior of a car at the test facility – is surprising given crash speed is a mere 30 mph. Dr. Flaura Winston of the Center for Injury Research and Prevention said that it’s important to secure any pets traveling in your car because they become projectiles, hurting [Ed. or killing] themselves and others. As for consumer protections provided by government agencies, Consumer Product Safety Commission (CPSC) told NBC News that they have no jurisdiction over these products according to their mandate from Congress, suggesting NBC should check with the National Highway Safety Administration. The NHSA told NBC to check with the CPSC. Products that failed these independent crash tests continue to be sold to the largely unsuspecting public. What a gift it must be for manufacturers to have a “get out of lawsuits” free card. Pets and people die, are seriously injured, and no one pays for irresponsible manufacturing or false advertising claims. You and I go unrepresented, even though we are consumers. Some manufacturers have expressed intent to correct defects according to Center for Pet Safety’s Lindsey Wolko, and are working on it – I have no doubt good brands are doing just that. We’ll see which brand gets certified next. And we’ll also see which do not. If you’d like to learn more, you can check out our recent podcasts and posts with Center for Pet Safety (CPS), and go to the CPS website. You’ll be glad you did. You may know how I hate to give you bad news with no recourse for taking action. 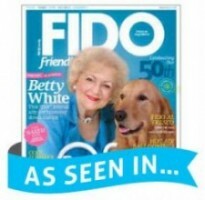 Note the new banner in the sidebar for Center for Pet Safety. Big or small, you can send any size donation Paypal will allow. Care to contribute the price of a Starbuck’s? Please do! 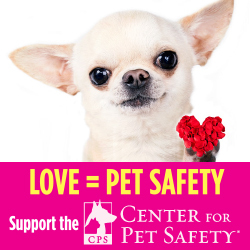 And if you have a site of your own and would like a banner, just let me know in the comments, via email, or check out the Center for Pet Safety site for more. Pet parents can help keep Center for Pet Safety doing the job that needs to be done, exposing unsafe products. Government moves too slowly on, well, most things. Manufacturers – some will fix the problem, some will stall until they must act, and others may try an end-run around independent testing. Without laws to hold pet products, all pet products, to a set of safety standards, I’m afraid significant change is not something all manufacturers are willing to offer. I hope I’m wrong. Center for Pet Safety reminder: If you’ve had a bad experience with a pet product, report it! It’s so important to document instances of pet product failure. Here are instructions on how to do that. If you’d like to help CPS test more products, helping you and your pets stay safe, be part of making change happen. You win, pets win, and, just as Consumer Reports has done successfully throughout the decades for consumer products, pet product manufacturers will be put on notice – no more pet product safety fails — pets deserve your best. Now take a look at the video report. @dancingdogblog I totally agree that products that claim to keep a pet safe should have to prove that they live up to their marketing! I met Lindsey W at BlogPaws a few years back and loved talking to her and why she does what she does. We follow her advice and have a harness for Dex from this list. I first saw some of the crash tests years ago when Sleepypod came out with their first ClickIt travel harness. I remember thinking I needed something better for Oz to travel in the car with us because the crash tests results are downright scary. I have both the original ClickIt harness and the newer ClickIt Sport - both are excellent and have passed the crash-tests with a 5-star rating. I am so happy I have them and just wish that other car restraints would improve their reliability and safety as well. Pets should be protected as much as adults and children are in the car. Obviously the pet products are focused on profit not pet safety. How shameful there is no redress. I saw the episode on TV and the images were terrifying. We as consumers expect theses products to be safe for our fur babies. Excellent post, thank you Mary! Consumers are starting to fight back to both pet food manufacturers and pet products, we are demanding the same level of safety for our fur kids as we do our human kids - and why shouldn't we?? Pets are family now, companies need to recognize that and produce products and services appropriately. Thanks for doing all this research and sharing it with us! Wow. Those photos of crash tests are horrifying. Thank you for sharing this information. We are huge believers in buckling up and safety first. I want to know that my product will indeed be safe. This awareness is so important. Thank you for writing about it. The Rossen report was eye opening! With a big trip to Arizona this summer to BlogPaws conference I need to look into a better seat belt. UUUUGH! Those are some terrifying images. Those are stuffed toys, but the reality is, it does happen! Thank you for sharing this information. Terrifying describes the action in those photos well. Those specially constructed and designed test dogs tell the tale of what happens in a 30 mph crash. What I see is "what if that was my dog". I shudder. I couldn't agree more. If a product is going to claim that it can keep your pets safe, it should be required to actually do that. It isn't unreasonable to ask that devices made to transport our pets via car can handle a 30 mph crash. I would definitely pay a higher price for a safe, reliable product. Thanks Robin. This is the main concern I think we all have. Pet products should serve their purpose without harming pets or people =) Thanks for stopping by! Are there any car seats that are safe for dogs? It is very disturbing to me that these companies are intentionally misleading consumers. We've read a lot of literature on this very topic - thanks for sharing, it's important information! I wish more people would write about it, keep the problem in the spotlight. I'm afraid the public mind is too full of the bad news of the day to notice this before their next trip to the pet store :/ Glad you're checking this out, and thanks for chiming in! This is really scary - all three of our dogs ride in their crates, even to the park -a short distance from our house! I'm happy to see the CPS doing such important work - I'll look for updates on products I can look at. I was disturbed when I read your previous post/listened to the podcast, and I still am. Glad the national news got in on the action, and that at least a few manufacturers seem to want to get in compliance. It's the least they could do, right? (sarcasm) I will not buy anything but Sleepy Pod for car safety now. I hope they stay in business a long time! Pet Ego also had a lovely carrier pass the test -- their ISOFIX Latch Connection. I've not heard of them until this testing or purchased from them before, but they are Italian designs and I need to remind myself that they should be heaped with praise too! Thanks for your thoughts, Elizabeth! I knew that there were a lot of products on the market that failed the safety tests but I had no idea you could actually report the fail! It's pretty scary that they are being allowed to continue to have these products out there! Thank you for sharing! @ZoePheeDogs Oh, hey, that's great that you now know you can report the fail! Love that, and thanks for telling me. We spend sooo much money on these products it's only right to report fails to the mfg and through CPS. Wow! How frightening that this could actually happen in a crash! Those photos show quite a frightening picture of what could happen in a crash. Yikes! We have a Sleepypod that I bought specifically because of the test results. I hope some manufacturer comes up with a crash-tested, safe car seat. I think Mr. N would prefer that. @tenaciouslittleterrier Just make sure the product is independently tested -- for real :) Mr N is pretty small, isn't he? I think Sleepypod recommended all dogs under 16 lbs be in carriers on the floor of the back seat. Maybe that will change, but for now, Tashi doesn't like it either, but I'd rather he not get fractured/badly bruised. When you look at the force a 30 mph crash produces, that's a lot of pressure on a small dogs bones. And generally, depending on where you live and drive, the normal speed is higher than that, so the force is even greater. I worry about stuff like that and know you do too! Thanks for the visit! Pet safety is so important when travelling in the car - that's why I also seatbelt the cat carriers into the car so that they're even more secure.